In a previous post I explained how to install SiteBar on your own server. This post is my experiences of using SiteBar , if you don’t have a server to install SiteBar on, you can use the service provided by the authors of SiteBar. SiteBar is GPL open source. Once you have signed up and logged in you are ready to go. 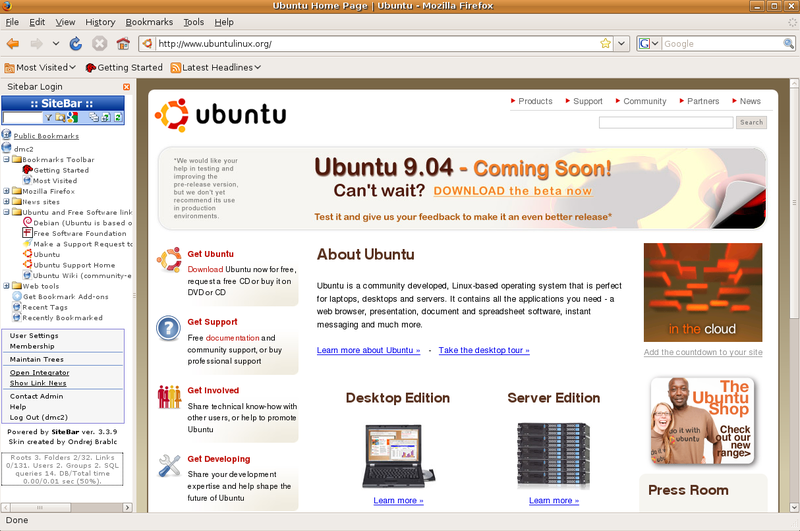 Although SiteBar works with any browser it looks and works best with a browser that can have a site displayed in a sidebar such as Firefox , Opera and later versions of IE. 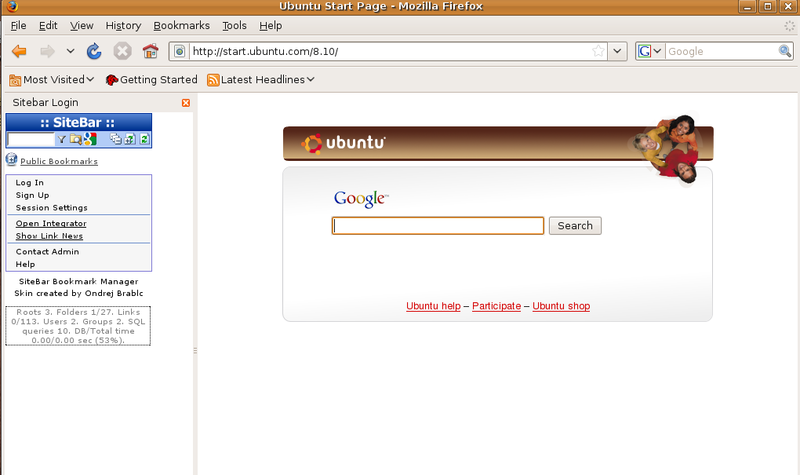 Go to the start link of your SiteBar web site , highlight the web address including the http:// part and then Edit – Copy. 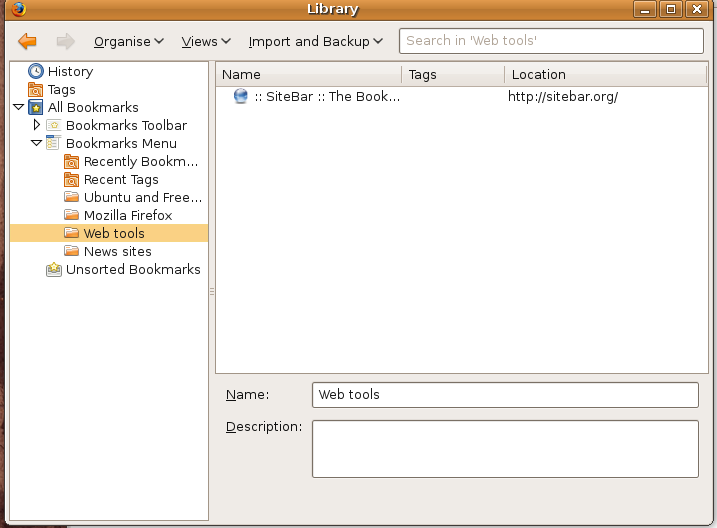 Next select Bookmarks from the Firefox tool bar , then Organise Bookmarks. 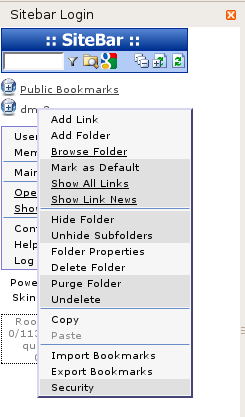 A new window appears, expand Bookmarks Menu and select the folder you want the SiteBar bookmark to go to. Select Organise – Add Bookmark from the toolbar. A new window appears as below. Fill in the Name , right click- paste in the Location field so the web address of your Sitebar site you copied to the clipboard above inserts. Fill in the Keyword and Description fields. Click the box Load this bookmark in the sidebar , then click Add. Close the organise bookmarks window. Now when you go to bookmarks and select the bookmark you created above a sidebar will be opened with the SiteBar in it. Having Sitebar in a sidebar really makes SiteBar brilliant to use. Sign into SiteBar. 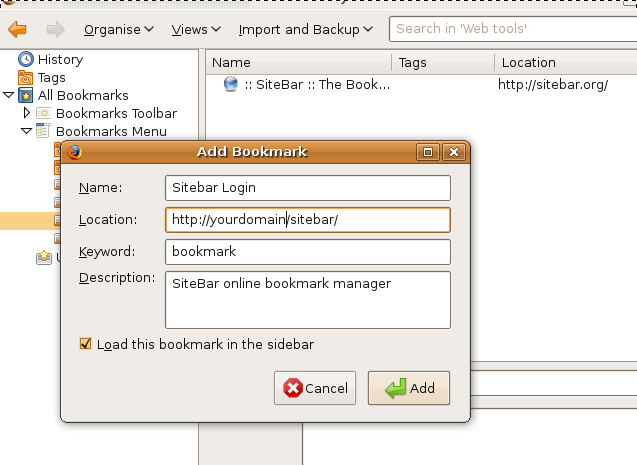 If you want to import your current bookmarks into SiteBar this is easy to do and it can handle various formats. First you have to export you browser bookmarks into a file. For Firefox go to Bookmark – Organise Bookmarks – Import and Backup – Export HTML , save the file and remember the filename and location. For Internet Explorer follow the instructions here. 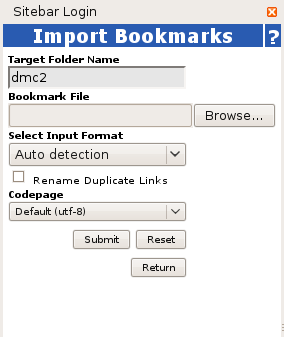 The Import Bookmarks screen will display, use the Browse button to select the export file you saved above with your browsers bookmarks in it. The rest of the options can normally be left as default. Then click on Submit. Once done , if you click on you username all of your imported bookmarks will display. You can delete bookmarks and folders by right clicking on the entry. To go to a web site using a SiteBar bookmark just click on the bookmark and the website will appear in a new tab, the SiteBar sidebar will still be available. To add a new folder just right click where you want the new folder to be and fill in the form to give it a name. To add a link go to the web site in a browser tab . In SiteBar right click on the folder you want the bookmark to appear in and Add Link. Highlight the web address of the web site you want to bookmark in the browser tab and holding down the left mouse button drag the URL into the URL field in the SiteBar menu. Next click on the Retrieve Link Information button – and here is the really nifty bit – SiteBar will go and get the link information from the web site you want to bookmark including the Favicon if available. What information it brings back is dependent on the target web site – some sites seem very good and SiteBar will even fill in the description field. Edit the fields as you wish and click Submit. This will display in a tab your SiteBar bookmarks matching the keyword in the top half of the screen ordered by how often you have clicked on them together with links from the SiteBar community and a Google search ( you can change your default search engine ) in the bottom half . 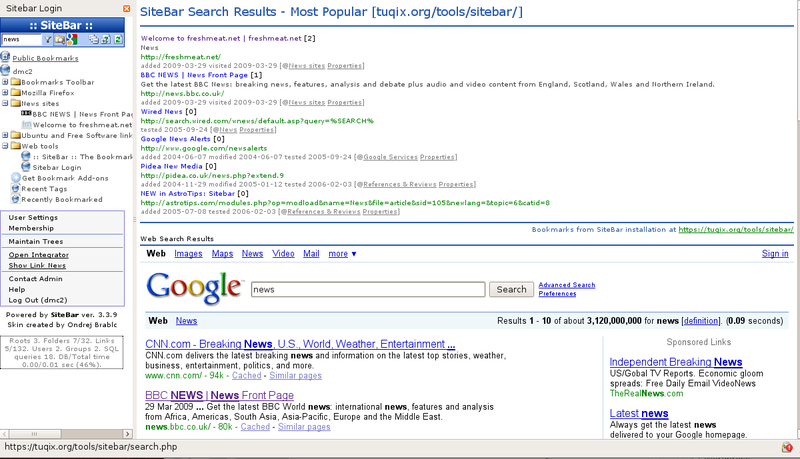 See below as example of a search for the keyword news. It has picked up two bookmarks in my SiteBar – Freshmeat and BBC news. There are lots of other features in SiteBar that I need to explore. I highly recommend SiteBar as a web based bookmark manager.